Leading a 17-state charge up a steep legal hill, Attorney General and soon-to-be-Gov.Greg Abbott on Wednesday filed a federal lawsuit challenging the Obama administration's moves to expand legal protections for undocumented immigrants. 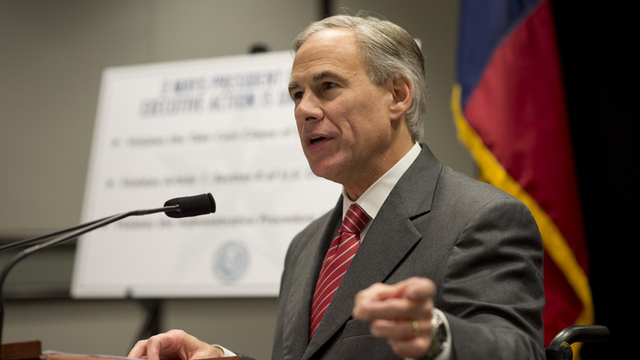 The lawsuit, the 31st Abbott has filed against the Obama administration during his 12-year tenure, fulfills his gubernatorial campaign pledge to challenge PresidentObama’s executive action to protect up to 5 million undocumented immigrants from the threat of immediate deportation. Legal and political experts said they were skeptical of the suit's legal underpinnings. "It’s ill advised. I don’t think he has standing. He gets the basic terminology wrong, and he protests too much when he says he’s not politicizing it, because all of it is simply about the politics of it,” said Michael Olivas, an immigration lawyer and professor at the University of Houston. "He characterizes what the president did as an executive order — it is not an executive order. It's executive action." Filed in the Southern District of Texas, the suit argues Obama’s actions are unconstitutional and violate the federal Administrative Procedure Act. It also argues that the president’s order will “exacerbate” the border crisis and force states to spend more on law enforcement, health care and education. The suit does not ask for a restraining order to immediately halt the changes, but does request that they be declared illegal. The Obama administration, Abbott said, is leaning on the idea of prosecutorial discretion to argue the legality of the president's executive action, effectively saying a decision not to deport someone is akin to a decision not to prosecute him or her. In a 33-page memo, the Justice Department’s Office of Legal Counsel has argued that "the exercise of enforcement discretion generally is not subject to judicial review." But legal and political experts said Obama's moves are similar to those taken by former presidents, Democratic and Republican. Brandon Rottinghaus, an associate professor at the University of Houston, said Abbott was politically obligated to file the suit because of his campaign promises. "This is exactly the issue that both [Lt. Gov.-elect] Dan Patrick and Greg Abbott ran on, and they both cannot sit idly by, politically, and let the president simply do this," Rottinghaus said. "This is something that is certainly a political issue." Rottinghaus said courts have been reluctant to intervene in matters of separation of power. "In general, courts don't like to get involve in this kind of inter-branch fight because, really, nobody wins because no matter how the court rules. Somebody is going to get mad," Rottinghaus said.